You are here: Home » GENRE » Science » Goodbye Kepler, planet-hunter par excellence. Goodbye Kepler, planet-hunter par excellence. The observation of so many stars has allowed scientists to better understand stellar behaviours and properties, which is critical information in studying the planets that orbit them. New research into stars with Kepler data also is furthering other areas of astronomy, such as the history of our Milky Way galaxy and the beginning stages of exploding stars called supernovae that are used to study how fast the universe is expanding. The data from the extended mission were also made available to the public and science community immediately, allowing discoveries to be made at an incredible pace and setting a high bar for other missions. Scientists are expected to spend a decade or more in search of new discoveries in the treasure trove of data Kepler provided. 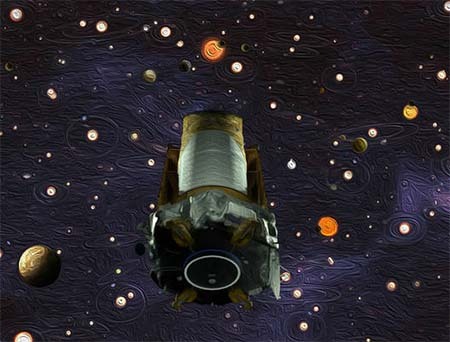 Before retiring the spacecraft, scientists pushed Kepler to its full potential, successfully completing multiple observation campaigns and downloading valuable science data even after initial warnings of low fuel. The latest data, from Campaign 19, will complement the data from NASA’s newest planet hunter, the Transiting Exoplanet Survey Satellite, launched in April. TESS builds on Kepler’s foundation with fresh batches of data in its search of planets orbiting some 200,000 of the brightest and nearest stars to the Earth, worlds that can later be explored for signs of life by missions, such as NASA’s James Webb Space Telescope. NASA finds smallest habitable zone worlds yet. Kepler… King of the Planet Hunters! The great bonanza of worlds. The very, very small planet. NASA’s empire of a thousand worlds. « NASA 1958 Onwards: Operation Manual by David Baker (book review).